Mary Fisher, vice president of Energy Production and Nuclear Decommissioning, said it’s something OPPD customers have been wanting for some time. “Our customers have really been asking for a solar option,” she said . . . Community solar facilities are built by a third-party operation and run by the utility company. NextEra Energy Resources, LLC, will build this facility. OPPD awarded a 20-year power purchase agreement to a Next Era subsidiary. Once the facility is underway, individual consumers can then buy shares or a “subscription” to the facility. Shareholders would bear the extra cost for the facility, but would also reap the benefits. Read more here. Photo: Lincoln Electric System’s 5-kilowatt community solar farm, located on a portion of a 46-acre site near Northwest 75th and Holdrege Streets. See Solar Examples. This entry was posted in Community-Scale Solar, Nebraska / Midwest News and tagged Lincoln Electric System's SunShares, Nebraskans for Solar NewsBlog, NextEra Energy Resources, OPPD's pilot community solar development, solar benefits all utility customers, Solar Energy Industries Association Blog, Washington County Pilot-Tribune and Enterprise on June 12, 2018 by Helen Deffenbacher. Omaha Public Power District Customers will soon be able to support the local production and use of solar power – at a cost. OPPD as early as next year will start selling shares of solar power to customers interested in using more renewable power, including those who lack the means to buy or lease their own solar panels . 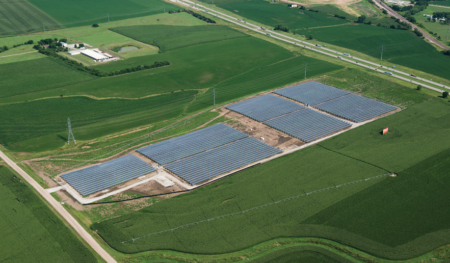 . . Michael Shonka, president of Nebraskans for Solar, called OPPD’s effort “a start” but said other utilities offer customers solar power at market rate, with the potential of getting ahead financially. Click here to read the entire article. This entry was posted in Community-Scale Solar, Financing, Nebraska / Midwest News and tagged Lincoln Electric System's SunShares, Michael Shonka - President of Nebraskans for Solar, Omaha Public Power District (OPPD), Omaha Public Power District's community solar on April 9, 2018 by Helen Deffenbacher.